It's a fantastic album with great musicianship and excellent songwriting. 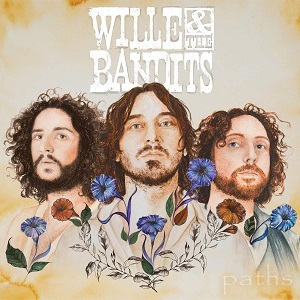 Wille & the bandits will release their new album, “Paths” on 1st February 2019 and are due to follow that with a 19 date UK tour in March with Rainbreakers as special guests. If you’ve seen them live you’ll know Wille & the bandits are a superb live act with an amazing amount of power and energy. Often bands like that translate poorly to record as you somehow lose much of the raw energy of their live show. This album does a much better job than I’d expected of capturing and reproducing some of that live raw energy – you really do get a lot of that live feel from the album. Unusually for such a high energy live band, they don’t stick to the simple gutiar, bass and drums formula. Wille Edwards plays not only electric guitar but also acoustic guitar, electric lap steel, dobro and electric weissenhorn – and of course he does lead vocals too. Matt Brooks not only plays a 6 string bass, but also a 5 string double bass and cello, while Andrew Naumann plays drums, congas, djemebes, jews harp, udu, shakers and wood and steel tongue drums. That diverse range of instruments allows them to add more variety to their sound, but it’s always done subtly where a song calls for it – you never get bits where a particular instrument stands out so much you can’t mistake it, instead it’s there if you listen closely, but always as an integral part of the music. The album kicks off with “One way” – a great song with a nice brisk pace and plenty of energy to get things underway. The lyrics list various leaders who have stood for peaces (such as Mahatma Gandhi) in the chorus while the verses are about how Western countries and their less desirable foreign policy choices. It’s a subject that could have turned into a depressing diatribe but the pace of the music and the well written lyrics stop it sinking to that level and instead keep it as a great song to listen to. A very different song is “How long” – it’s a slower paced song which is appropriate for the subject and inspiration of the lyrics. Inspired by the death of one of Wille’s favourite singers, Chris Cornell, the song is about depression and how long it takes to overcome it. It’s a fantastic album. There’s the fast high energy songs that really capture that live feel, and there are softer more thoughtful songs, and of course everything in between. There’s plenty of variety here but what is consistent throughout is the great musicianship and the excellent songwriting. Previous Beth Blade And The Beautiful Disasters – Show Me Your Teeth.